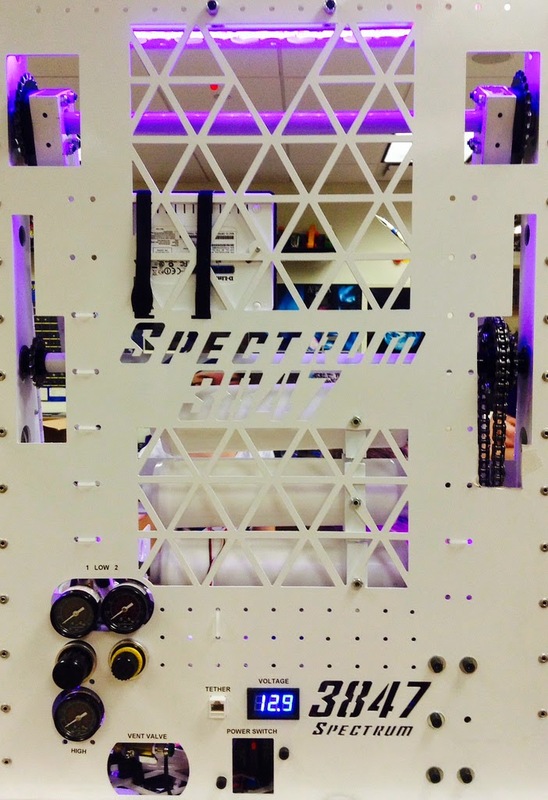 If you followed along during the build season, you saw nearly all of our collector prototyping. We spent many hours getting to the final version of our collector. This is truly iteration at it's best. We initially took our cues from the 72 hour builds that mostly used over the top rollers. After that we looked into a version of team Boom Done's El Toro style collector. We modified the axis of rotation to allow for smoother contact with the ball. This system worked alright but it still wasn't fast enough for our needs. 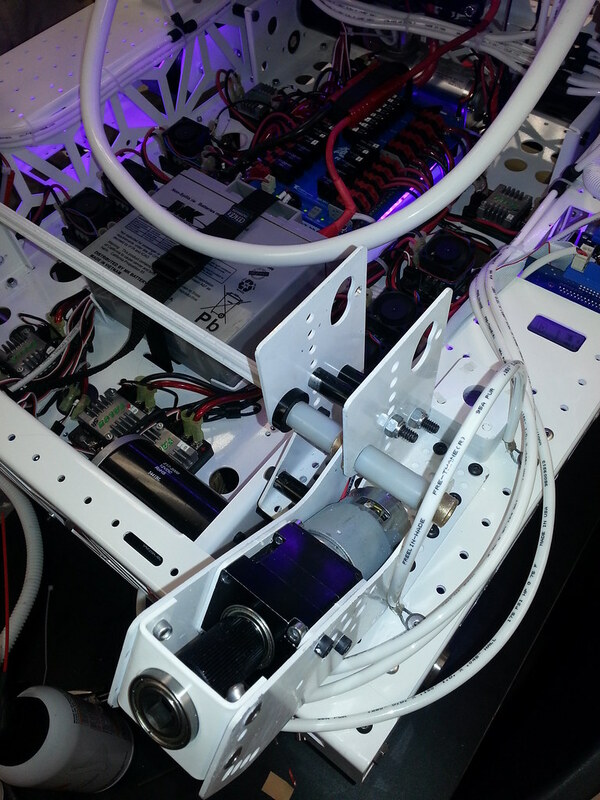 The prototype also had the collector motors out past the bumpers which was the opposite of our design goals. Overall we were happy with the speed of collection and we thought this would give us a wide angle to collect from. We also tried several other failed attempts during the phase including spinning a polycarbonate stick and other solid shaft collectors like Boom Done's original design, we didn't like that they had to expand so far around the ball and thought the wheels would be better. In the next video you will see the first sheet metal version of the collector. 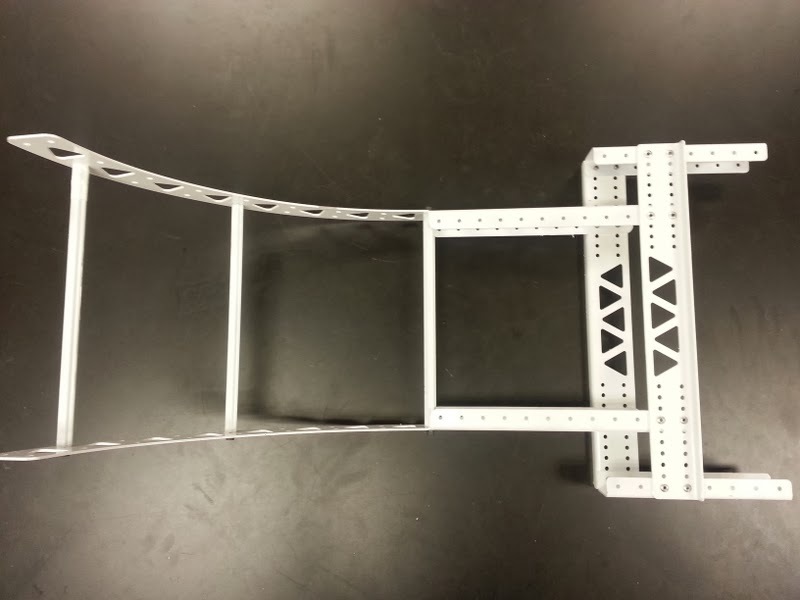 It has 3 degrees of freedom being able to move up and down, left and right and spin each collector stick. Again the system worked but we know improving it would be necessary. During this process we had found that we kept needing to tighten the surgical tubing that we used to all our collector sticks to pivot in and out. Eventually we realized we could hard mount them and just use the ball compression to allow us to collect them. At the same time we tested the collector wheels (formally known as mecanum wheels) on our collector. They worked very well. They allowed us to center the ball and collect from a very wide area in front of the robot. At this point we were still using prototypes and bolting things down to pieces that weren't designed for it. The final version is actually pretty simple. It uses 2 pneumatic cylinders (1 1/16" bore, 1.5" stroke, double acting), 2 BB775 motors in 10:1 VersaPlanetary Gearboxes with 1/2" hex output shafts and simple sheet metal plates. To extend the hex shafts we used colson live hubs from 221systems. We did have to cut down the hex output shafts from the VPs this allows the coupler to fit right up against the gearbox. Just on the other side of the coupler we mount a hex bearing in a small sheet metal c channel. The bottom wheel is a 3.25" VexPRO versawheel and the shaft is an uncut 18" long VEXpro 1/2" hex shaft. We put together a quick gif showing all parts that go in to the collector mechanism. It really is rather simple. The spacers in this setup are all VEXpro tube axle with 1/4-20 bolts going through them. 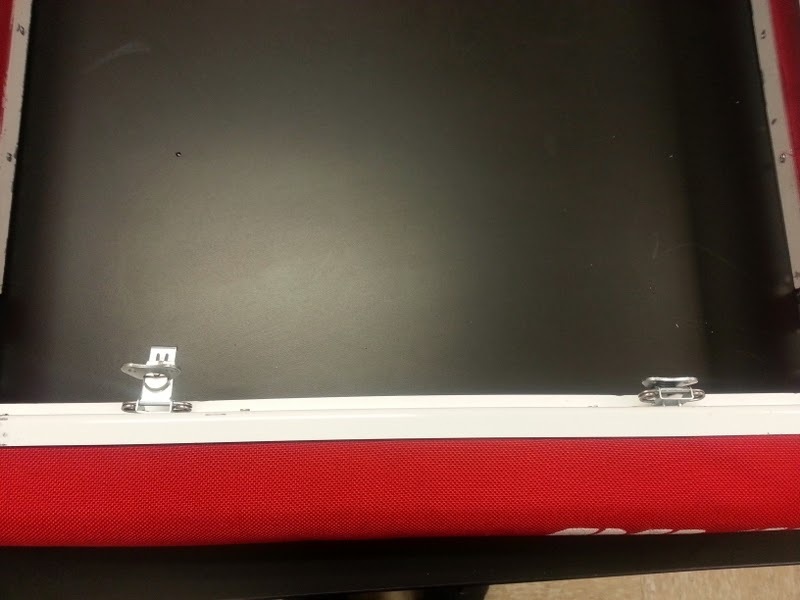 To stabilize the two structures we have a piece of AndyMark churro tube that is tapped on both ends with a 1/4-20 bolt screwed into it. We actually use this bar as a hard stop for our launcher bar as well. We call this collector "Sipping Bird" because we thought it looked like a drinking bird when it was first CADed. We also didn't know what a drinking bird was called at the time. You may have seen in our reveal video that we had purple hubs on the collector wheels. Those were 3D printed parts but when we practiced with them we were able to break them when they got caught on the side of the field. They worked fine in compression but once they were in tension the plastic could not take the stress. We moved back to the real VEXpro hubs and had no problems at the Dallas Regional. 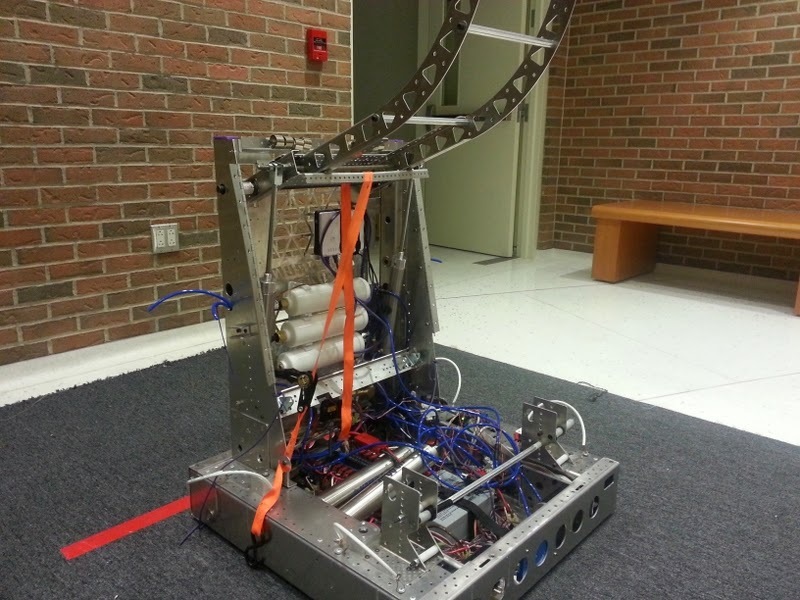 We did have a small issue when we got entangled with a robot that had a net but that was it. We also had 4" Versawheels in the video and in the reveal but we found the smaller wheels worked much better so we moved to the 3.25" wheels with the hex bore already in them. 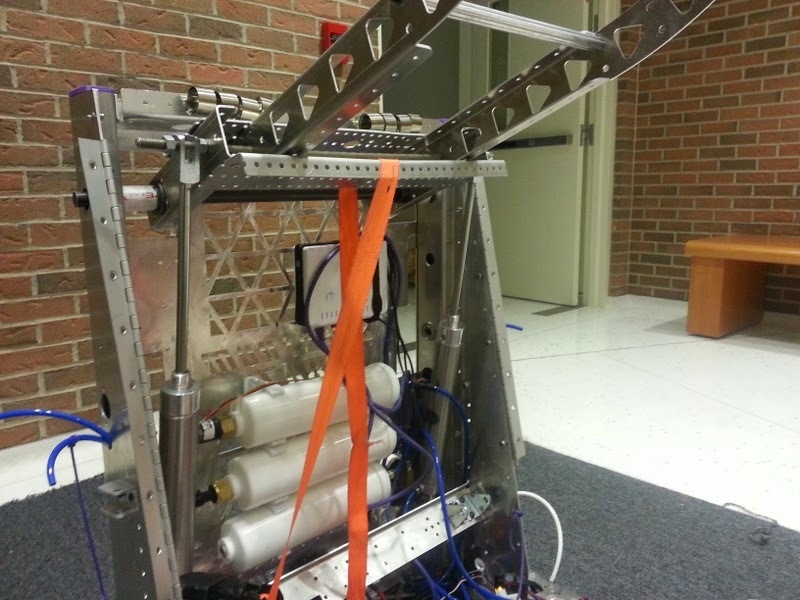 The distance between the two hex shafts on the collector is about 23". We compress the ball to have it go through the collector. 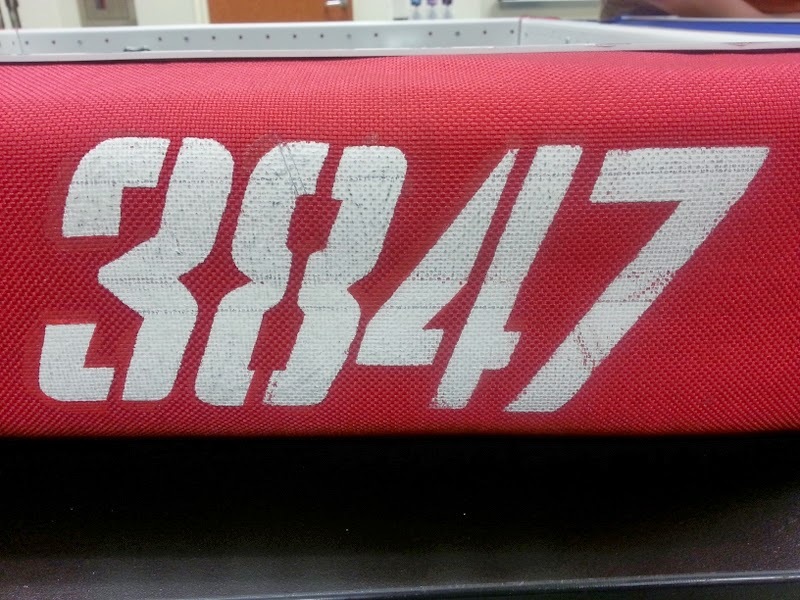 Yesterday we were able to go up to the Woodlands to practice with our friends FRC#1477 Texas Torque. 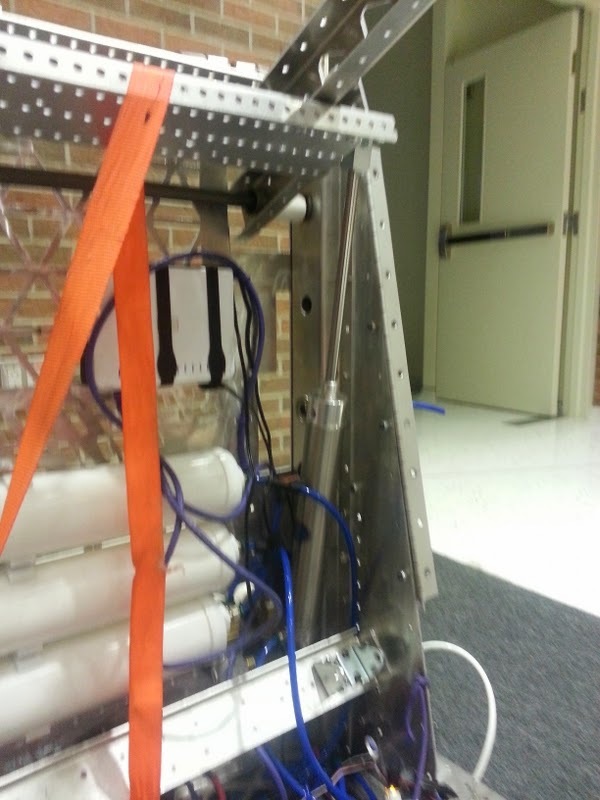 While there we got to work on our running shot with our new pneumatic launcher. We also worked on an automated truss shot that ensures we are fully inside the white zone before firing the truss. One of the features we are most proud of on Infrared is our back panel. 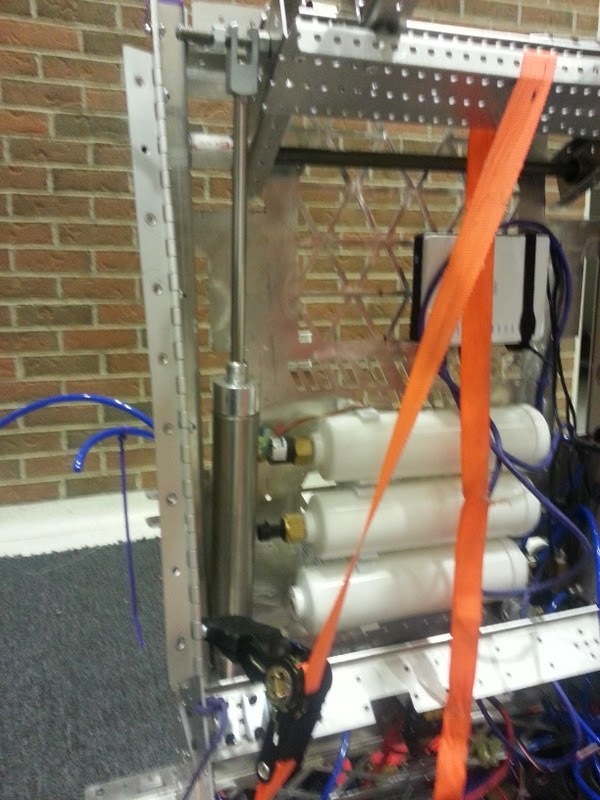 It integrates our launcher and all of our pneumatic system. It also has a place for our instrumentation panel. Starting at the top is location for our launcher bar to mount. Below that is a radio mount that uses the screw mounts on the back of the radio along with Velcro straps to secure it. The Velcro straps also secure the radio power connector so it doesn't come loose. Below the radio is the second shaft is the intermediate shaft for the launcher it takes the first stage reduction and moves power to both sides of the launcher to keep them even. Below that shaft is the mounting location for three of our air tanks. On the right side we have our pneumatic controls, it includes all three of our gauges and both our regulators along with our vent valve. The pneumatic instrumentation is mounted with the regulator mounting nuts. To the right of the pneumatic instrumentation is our tether port, voltage display and main breaker. The tether port that we use is a common keystone connector for use in a wall or similar home installation. We purchased our from Amazon. Then there is just a small Ethernet cable that runs up to the router from this panel. The voltage gauge is a simple two wire voltage gauge that plugs into the same breaker location that use to power our LEDs off of a terminal strip. We bought them from overseas to get them cheaper. The power switch is mounted on stand offs so it's recessed. 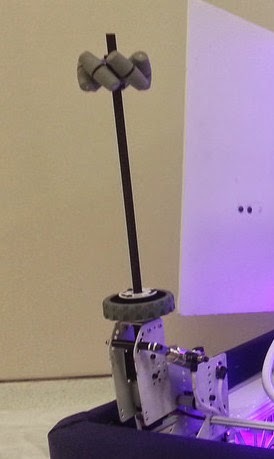 It's very easy for a hand to turn on or off the robot but it is nearly impossible for any object or robot to accidentally hit the power switch. We have been working on our robot in the past few days since Dallas. We had several problems with our launcher at event when ever you put it out for a real match. It just wasn't consistent. It was pretty easy getting the prototype working and we should be able to do the final make over, quickly on Friday at Lone Star. We did have to play around with launch geometry but it wasn't that complicated. We also looked pulse timing and we found we can change our shot pretty easily using it. We are going to start our Inside Infrared series with something that seems pretty easy, our bumpers. 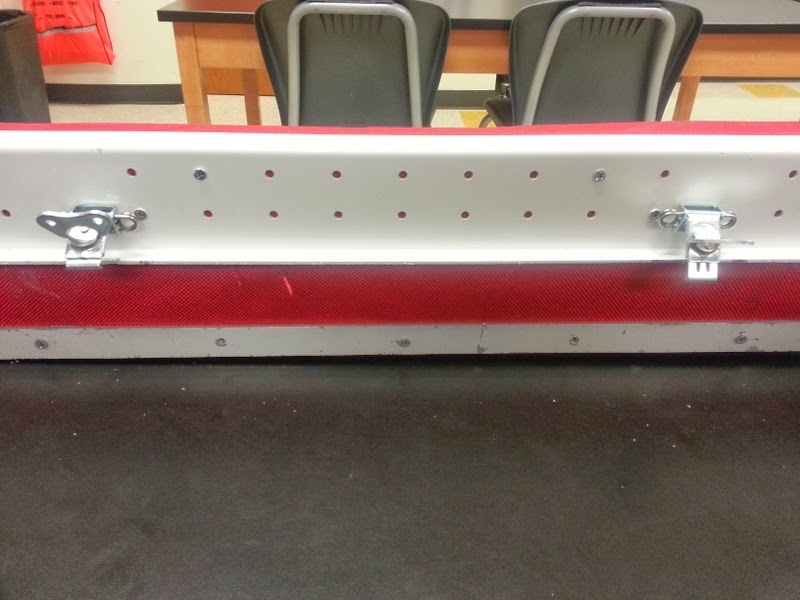 Teams have been iterating bumper designs for a long time. Here are our bumpers for this season. The blue set is 19.5lbs and the red set is 18lbs. 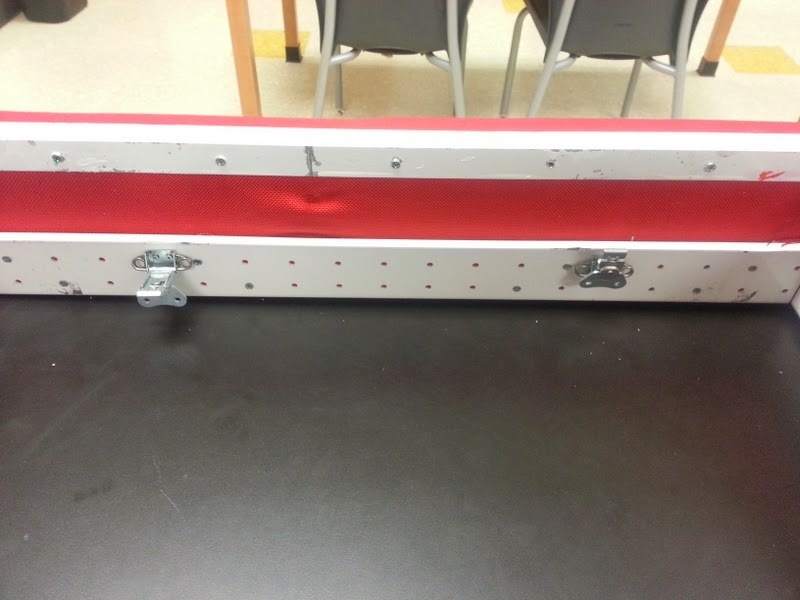 Each bumper is made from a 10ft piece of 1x6 which is really 3/4" x 5.5" solid wood. This is much cheaper and easier for us to use since we don't have a table saw. For our fabric we used 1000D Cordura that we purchased from eBay for about $10 a yard. 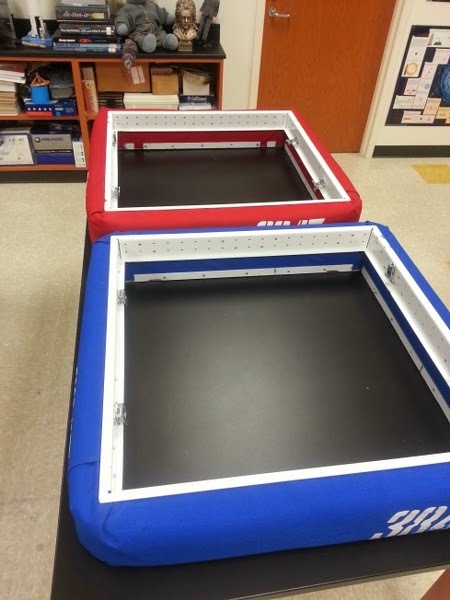 We bought 4 yards of each red and blue and will have bumpers for at least 3 seasons from that purchase. 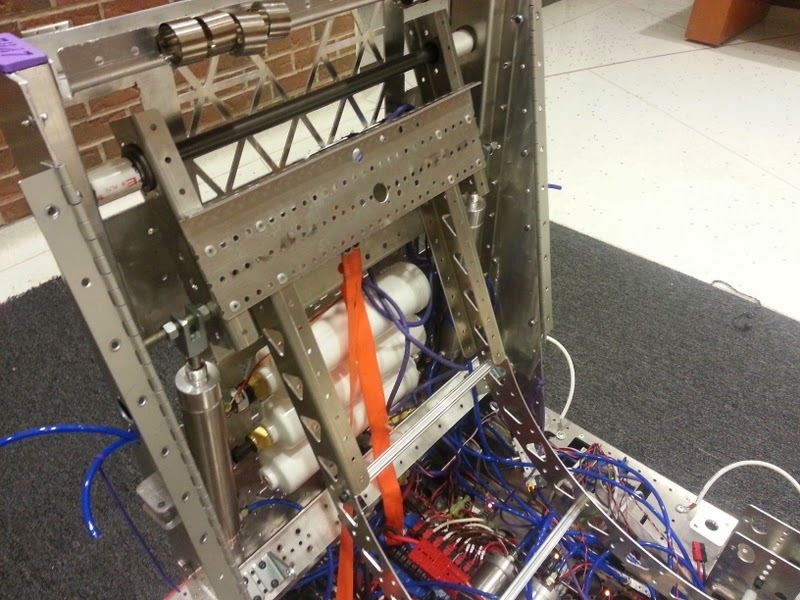 To mount our bumpers we used a sheet metal supporting structure that is inspired by 148's 2011 robot, Raptor. 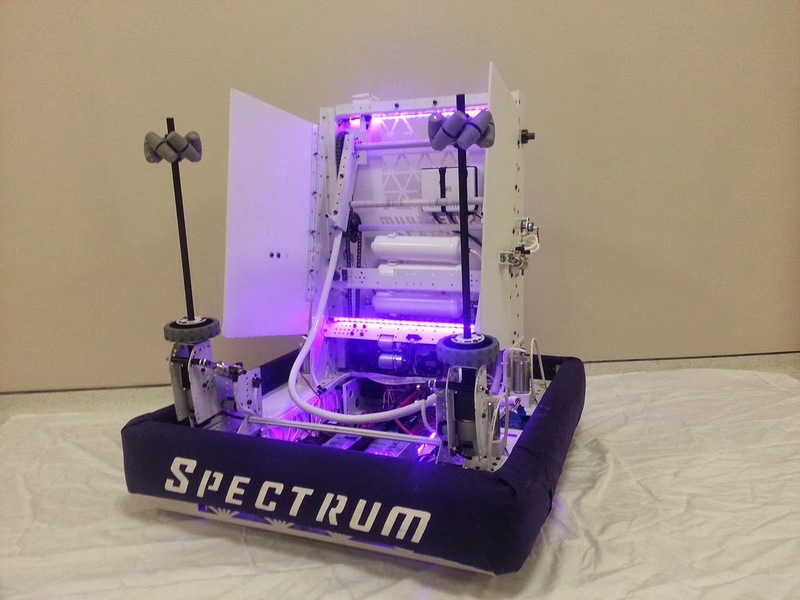 The bumper support goes around the entire robot and it most be put on over the top of the robot. Here is the drawing of what we had laser cut for our mount. 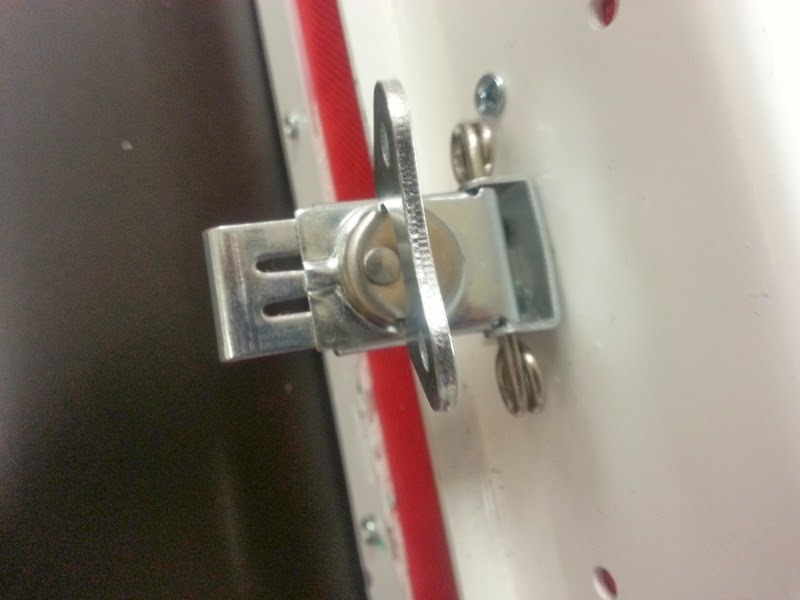 To actually latch our bumpers on to our frame we use butterfly latches that are commonly used on road cases. We found these during the off season and retro fitted them on to our 2013 robot for our off season events. These are great for bumpers since they allow for tool less install and remove of each set. We also purchased these from eBay, they are about $2.50 each and we use 4 on each bumper set. Make sure to the get the ones that include the springs they make securing the bumpers much easier. 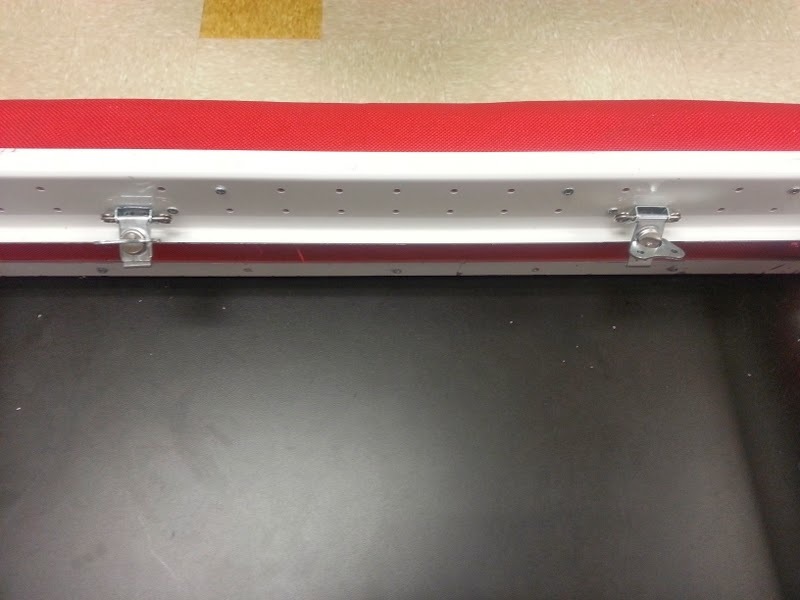 They attached to the robot in these slots that we put into our front and back frame rails. Along the bottom of the bumpers we attached 1" x 1/8" angle aluminum that secures the bottom edge of the bumpers and also seats them securely against our frame. For the past several years we have just painted on our numbers. We end up having to touch them up through out the season but they are easily visible from the stands and last a whole event. We custom make stencils our of manila folders that use our branded font. We didn't have many bumper problems at Dallas. There were a few matches that we had to pry up on corner of our bumpers because they slipped down past our frame but that wasn't a very big problem, they would only drop about an 1/8" which still keeps us within the bumper zone. "In many ways, it's the things that are not there that we are most proud of." - Jonathan Ive, iPad designer, on all the features that are missing from the iPad. We competed in Dallas this past weekend. We finished with a 9-7 record overall and made it to the semi-finals. We were the 4th overall selection for eliminations and we got to play on an alliance with our friends FRC#231 and FRC#2950. Here is the YouTube playlist for all of our matches this year. Here is one of our favorite matches of the event. Our launcher gave us problems all weekend. We practiced with 118 before the event and had very little problems with consistency or accuracy. When we were on the practice field at Dallas we could make shots just fine but when we would go out for a match our consistency was no where to be found. We will be working on changes to improve the shooter before Lone Star. We also submitted for the Chairman's Award at this event. We had a great presentation but the award was eventually given out to our friends from the Woodlands FRC#1477 Texas Torque. 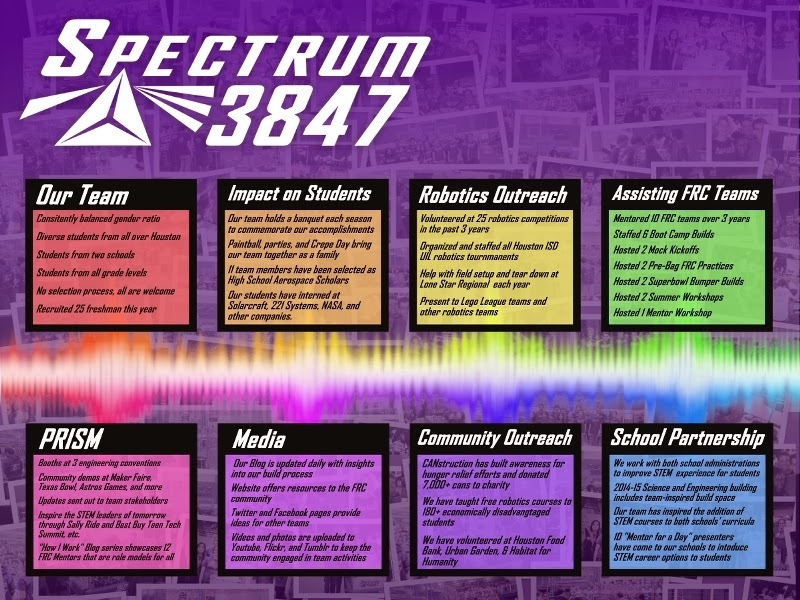 They are one of the best teams in FRC and have deserved to be recognized for their efforts for many years. 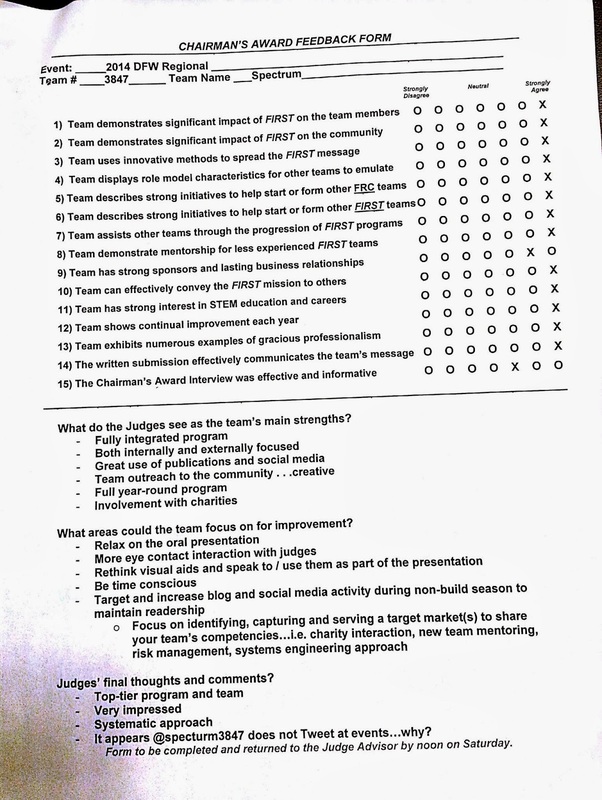 Below are our poster from our presentation and our feedback form from the judges. We have a lot of stuff to change before we present again at Lone Star in week 6. We have been quiet the past couple weeks but we have been very hard at work. We got the chance to practice with a few of our local teams this past weekend and we are very pleased with the practice performance. Hopefully it will all translate to the competition robot. We have a few additions to add in to our 45lbs withholding allowance including an entirely new shooter bar assembly. 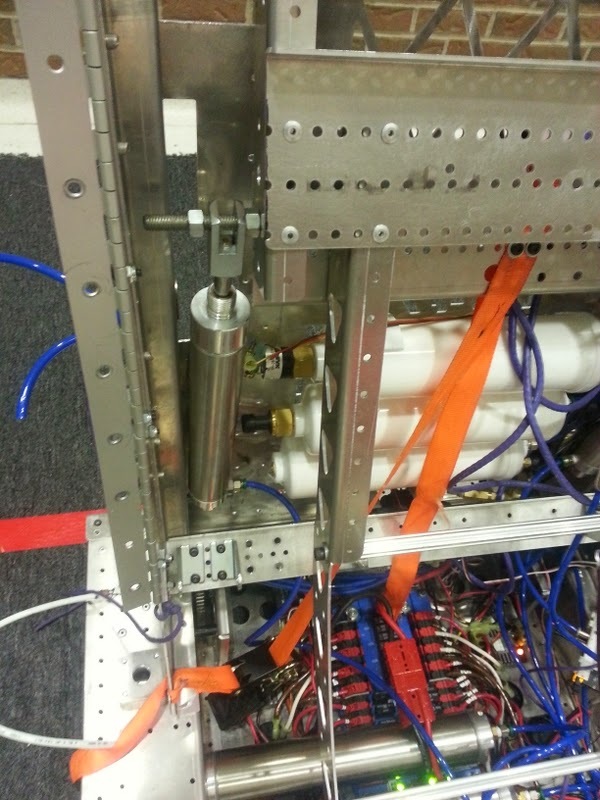 The bent conduit was giving us some inconsistent results at times, so we iterated and now we think we won't have any shots going straight up into the air. After watching weeks 1 and 2 of competition we also made a few minor tweaks to the way we hold the ball and also to our planned strategies. We're very excited to get Infrared on the field in a few days and see how she handles Aerial Assist.